Red hair is extremely rare it only goes above 1% west of Poland, north of central Spain, and south of northern Scandinavian and Finland and also over 5% in Volga Russia. Besides that it is almost non existent. Red hair is definitely the most unique hair color in the world. Originally all Humans had black hair so having red hair is just as crazy as having blue or green hair. Here is a map of R1b in Europe and close areas in Africa and Asia compared to the map of red hair which only includes areas with 1% or more red hair. R1b orignalley probably came from around Iran 18,000ybp. And pounced around the middle east till R1b L23 or a older subclade migrated to southern Russia and Ukriane possibly with proto Indo European language 6,000-8,000ybp. So by around that time you would have had the first white people with mainly R1b. These people were the ones who then spread to western Europe starting 5,000ybp spreading Germanic and Italo Celtic languages and R1b L51-L11 click here it is a thread were i explain it. So if it is true that the Germanic Italo Celts spread red hair to western Europe or at least raised the percentages over 1% they would have gotten that red hair from a non R1b group of people around Russia or Ukraine 8,000ybp. That mean there was a very red hair 15-30% people lived around Russia and Ukraine at least over 8,000ybp. Then when they adopted Indo European languages spread it to western Europe starting 5,000ybp. Another ancient Indo European people migrating out of the Russia and Ukraine area starting 5,000ybp who probably had alot of red hair are proto Indo iranian speakers. BY looking at Y DNa R1a Z93 in modern Indo Iranian people in the mid east and India the ancestral forms R1a S224 and R1a M417 are actulley pretty popular in parts of eastern Europe. And the age estimates put the spread of R1a Z93 in asia from 5,000-3,500ybp so in the bronze age. Since the 1950's the most belived theory about spread of Indo European languages say proto Indo iranian languages spread out of Russia and Ukriane area 5,000-3,500ybp so it is pretty much a perfect match. DNA from suspected early Indo Iranian cultures in asia show they had Y DNa R1a1a(probably deeper subclade), light skin, and mainly light hair and eyes. Also 7 Y DNa samples from 4,000 year old mixed European east asian mummies in tarim basin china has Y DNA R1a1a. So there was a huge migration and settlement of European people throughout central asia from 5,000-3,500ybp and many differnt groups like Sycthians stayed and survived till the early middle ages. 3,400 and 3,000 year old mummies in tarim basin China had red hair. There is really no doubt they were Indo Iranian speakers since there were no other European eople in that part of asia back then. Also ancient Greek historian Herdotus arund 400bc described the Sycthians and huge Indo Iranian group that took up most of central asia as having bright red hair. Also the Tocherians aka Yuezhi who were Indo Europeans in west china but probably not Indo Iranians. Art depicting them alot of times show's them with red hair. 3,000 year old Charcehn man 6 feet 6 inches tall. brown head hair and red facial hair. Painting of red haired Tocherian/Yuezhi and a Chinese I could not get a date i remeber one said 6th century ad it is probably somewhere around that time. The Tocherians/Yuezhi were conquered in the 600-700;s by Turkic speaking tribe the Ughurs who i think came from around Mongolia. But since Indo Iranian speakers and east asians have been mixing there for about 5,000 years. There will sometimes be east asian looking people with red hair and total european east asian mixes in the Ughur's. Here is a example of Ughur with red hair. Red hair today still exists in Indo Iranian speaking ethnic groups. When proto Indo Irnain Abashevo and Sinshta cultures spread out of northern Yamna culture in Russia 5,000ybp. They started tos pread throughout asia including all the areas from Iraq-India. Many groups like Sycthains did not inter marry that much but in the middle ages were conquered by Turkic tribes so they dont exist anymore. Today Indo Iranian laguages are dominte from iran-india and very popular in Iraq, Tukrey, and syria. Even though they were absorbed into dark haired ethnic groups in that area red hair did not completely die out. Pashuten redhead and his dad in Afghanistan. Izzat Ibrahim al-Douri Iraqi military commander and was vice president of the Iraqi revloutionary Command Council. Until his leader Saddam hussien was defeated by America. I could not find info if he is from Indo Iranian speaking Kurds in Iraq but there is no doubt his red hair is from the same type of Indo Iranian people like Sycthians who migrated out of northern Russia 5,000ybp. So there are two or at least one Indo European speaking people(maybe not Germanic Italo Celts) who migrated out of Russia Ukraine area starting about 5,000ybp both had pretty high amounts of red hair over 1% at the very very least. Also the Udmurt people in central Russia are the only non Germanic Italo Celtic and non indo Iranian speakers to have over 1% they actulley have the highest in the world 15-20% which is more evidence for a connection with Russia and red hair. So with just that information i think that there were people who had over 1% red hair living around Russia and Ukraine over 10,000ybp maybe even 20,000-30,000ybp. But i dont like these red hair maps because most only count areas with 1% or more. red hair is extremely recessive if there is red hair in Ukraine it wont show if red hair does exist acroos Europe and can be proven that it does not come from inter marriage with western Europe that would give a much older age to red hair and give a better idea about it's origin. When i am talking about non European redheads i don't mean albinos from India or those people in pupae new gunie who have red hair from totally different genes. I mean real redheads with super pale skin and alot of times freckles with the same genes for red hair as European redheads. The Kablye Berbers in the atlas mountains of Moorco are known for having red hair. I already made a thread about this i heard a missionary who went to moorco and because he had pale skin they though he was a kablye. He went to the atlas mountains and said they do look pretty European and there were some redheads. The Kablye are a very big ethnic group they are one of the biggest berber speakeing ethnic groups. Berbers take up most of northwest africa and if there was never arab muslim invasion berber language would probably be spoken in much more of north Africa. Riffian man with blonde head hair and red facial hair in Mooroco. Riffian are another Berber ethnic group and i guess they also are known for European features like Kablye. There are some Kablye tribes with 18% blonde hair so obviously they do get their red hair and pale skin from Europeans orignalley but when and who. It makes sense that they live literally right at the border of Africa and Europe but were did they get the blonde hair i doubt from Spanish. It seems they inter married with a group of Europeans like the Indo Iranians mainly blonde haired and high amounts of red hair it is very rare to find a peope group with alot of blonde and alot of red hair together. I made a theory that it came there from Iberia after the last ice age 15,000ybp. Because 19,000-10,000ybp there were huge migrations out of Iberia with mtDNA H1, H3, V, and U5b1 they also went to North Africa and 12,000 year old mtDNA V samples in the atlas mountains prove it happened that long ago. Maybe the people in Iberia back then went extinct or migrated to other areas in Europe and are not the main ancestors of modern Iberians so it is possible they had some red hair i dont know. Besides that i cant think of any idea what group of Europeans inter married with them. The Samartien redhead mystery is my favorite. The Samartiens are mentioned in the New testment of the Bible they were orignalley Jews but worshipped other Gods then Persians got them to inter marry with Assyrians then later they formed their own form of Judism i dont know the full story. They only bred with each other which causes alot of sickness there are only about 700 left. I dont know for sure but i think ever since they started so over 2,000ybp they only bred with each other. There have been aust DNa tests on every single Samartien alove not one had a single drop of European blood. 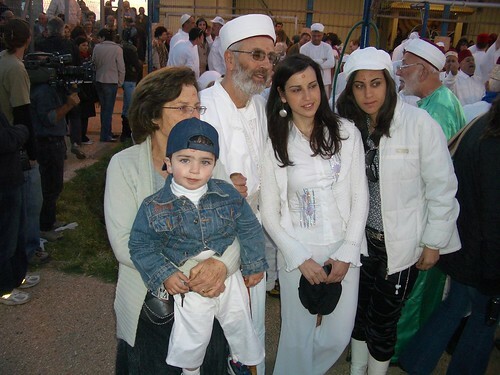 They were typical people from the Syria - Palestine area. Then i saw pictures of them during passover and many looked very European it seemd like more were pale skinned like Europeans than brown skinned. On the news they also showed a little Samartien boy with red hair and freckles and said that red hair is popular for them since they do not inter marry. 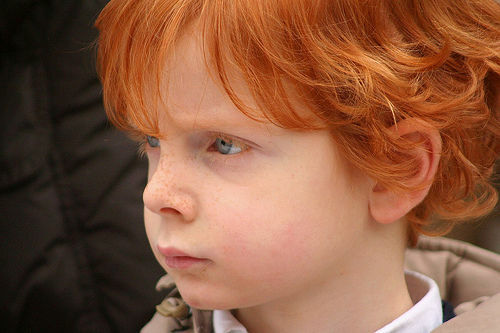 Redhead Samartien boy during passover. Other Smartiens. So u can get an idea of what i mean by how suprisngly pale they are. I cant believe that did not become famous how is there 100% mid eastern people with red hair. If this is completely true that shows red hair is from before the European family formed 30,000-60,000ybp. It at least originated in the mid east 50,000-70,000ybp. Red hair in my opinon may have orignated in Russia-Ukriane 12,000-30,000ybp or in another group of Europeans probably over 20,000ybp. Or it originated in the middle east with early Caucasians 50,000-70,000ybp. The first people to have over 1% red hair would deifntley have lived in Paleolithic Europe so over 11,000ybp there were at least some in Russia and Ukriane maybe also in other areas of Europe. Anyone who had red hair has at least great or great grandparents who also had red hair. So every red head is apart of a constant line of redheads going back at least over 15,000ybp to the first redhead. Also both parents need the gene for red hair for one of their children to have red hair. It is pretty common for someone to have either blonde or brown head hair but red facial hair since the genes for red hair work differently. The reason i said ancient HISTORIC times. Is because most people dont understand that histroic times are extremity young it only means times in history were we have written records. So the vast majority of the world has been recorded very recentley. The first writting that we still have records of and can see what the people are saying is around 6,000 years old in the mid east. So of course there is a very very low chance red hair will be mentioned. The Greeks are the first people in Europe were we have their ancient writing and can understand it. They started to write around 3,500ybp. The oldest mention of red hair is from around 500bc so 2,500ybp by Greek poet Xenphanes here is a quote "
". In Greek art Thracens are ofentlley depicted as red heads. The Thracian's lived in modern day Bulgaria so just north of Greece. Fresco on Thracian grave in central Bulgaira. Many Thracian graves had the inscription Rufus meaning redhead. Red hair today in Bulgaria does not reach 1% and since they are extremely dark haired and it is hard to believe they were known for red hair in ancient times. The Greeks may have exaggerated the red hair. Just saying i have meet to Romanian redheads which is right next to Bulgaria so it deifntley exists in that area. "The Budni are a large and powerful nation: they have all deep blue eyes, and bright red hair". The Budni were a Sythian tribe i already explained about the red hair in Indo Iranain speaking tribes of bronze-iron age central Asia. Right now i cant find any direct sources but i do remeber looking at ancient Roman writing mentiong red hair in the Gauls of central Europe and France. Also they said the Picts and other Insular Celts of Britain were very red haired. "All have fierce blue eyes, red hair, huge frames, fit only for a sudden exertion"
. So there is another ancient mention of red hair. The oldest depictions of red hair i could find is at least 2,284 years old. It is from the Estrucans who were a powerful civilization in central Italy from 764bc-264bc. Based on the fact that almost all of their paintgs depict people as brown skinned and that ancient writers say they orignalley came from Anatolia not Italy. Means they were not white or at least orignalley and probably had 0% red hair. 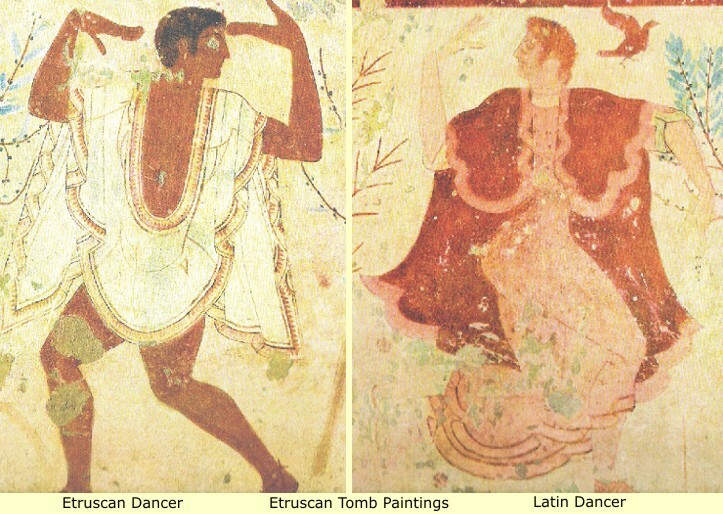 In Etruscan paintings there might be like two white people and 10 brown skinned people. The white people are probably from Italic or Celtic tribes in that area who are visiting Estrucans. The redhead was probably from a Italic or Celtic tribe. I already mentioned how red hair was probably spread to west Europe by Germanic Italo Celts and red hair is 1-3% in central Italy and a little south of were Estrucans lived. 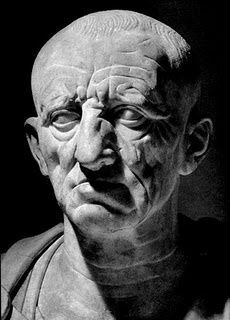 Cato the Elder born in 234bc died in 149bc. He was 100% from Latins who were Italic tribes from around Rome. 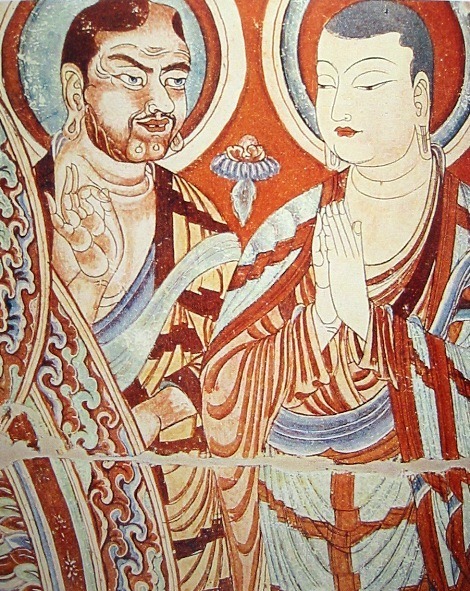 According to ancient writing when they mention his phiscal appearance they say he had red hair and grey eyes. He came from the general population and his family were known for their service in the Roman military. He was a very traditional Latin and was known as a grumpy old man. He fought in the war against Hannibal when he was 17 and is a very important person in Roman history. He has the oldest written records that we know for sure were written by someone with red hair. Bust of Cato the elder. The Suetoniu book " Life of the twleve Ceasars". Says that Emperor Vitellius the 8th Emperor of Rome was a redhead. He was Emperor from April 17, 69ad - December 20 69ad. ancient Sculpture of Vitellius from what i know the only redhead Roman emperor. From looking at the mummy of Pharaoh Ramses 11. Ruler of Eygpt from 1303 BC – July or August 1213 BC. Accroding to this link they determined he was a redhead. Last edited by Fire Haired; 09-06-2013 at 10:38 PM. Do you have any theory how the red hair became almost complete isolated to two separate parts of Europe? Well red hair at 1% is completely isolated to western Europe and volga Russia. My theory is that red hair was only over 1% in some people around RUssia and Ukriane over 10,000ybp. then When Indo European languages spread and they spread from that area over 1% red haired people spread with Germanic Italo celtic and Indo Iranian languages. I think something important to remember with figuring out the origin of red hair. Is that the distribution of red hair shows no connection with the distribution of fair hair. For example Finnish and Baltic people have mainly blonde hair but less than 1% red hair probably 0% at least orignalley before inter marriage with Germanic people. What this probably means is that red hair originated in a people group with no blonde hair or really low amounts and that blonde hair developed in a people group with no red hair. Yep, the blonde hair seems to be unrelated to red hair. The Udmurts have the highest percentage of red hair, 14% I think. The Pharaoh Ramses II had red hair. Maciamo, the author of such cartography, should start submitting refrences for his work. Since he attributed <1% for Portugal. Portugal scores a tax of 3% -5% Redheads accoding to anthropologist Eusébio Tamagnini in "A Pigmentação dos Portugueses" (1916/1933), followed by anthropologist António Mendes Correia in "A Origem dos Portugueses" (1919) and professor Luís de Pina's National Census of 31 (1931). Portugal itself has a village entitled "A dos Ruivos", after the redheads. Quick examples of contemporary celebrities can be found in here. My bro in law has red beard and light brown scalp hair. Kind of weird. Some black people have red hair. Horatio i really doubt he was a redhead. What really suprises me is King tut had Germanic Italo Celtic R1b L11 which is only found in western europe. Some Egyptiens inter married with Italo Celtic or Germanic tribes or inter married with another people group who before inter married with Germanic Italo Celts. If Ram really had red hair that could be the source. The Myths and History of Red Hair. Prove: Genghis Khan was red hair + King Tut was red hair but are they Aryan / White ?